The Nikon Coolpix L23 is a point and shoot style digital compact camera with a modest 10 megapixel resolution, 5x optical zoom and intelligent easy auto mode. The L series of Nikon compacts fits into the Lifestyle range which is a basic camera with all the features stripped out, including things such as a lithium ion battery, the L23 instead taking two AA types. At a low price point, the Nikon Coolpix L23 is ideal for those looking to take a small, handy camera on holiday or on nights out. The lack of overriding features makes it ideal for a technophobe who just wants a point and shoot camera and the low price means it's attractive to those who have little interest in developing their photographic knowledge. 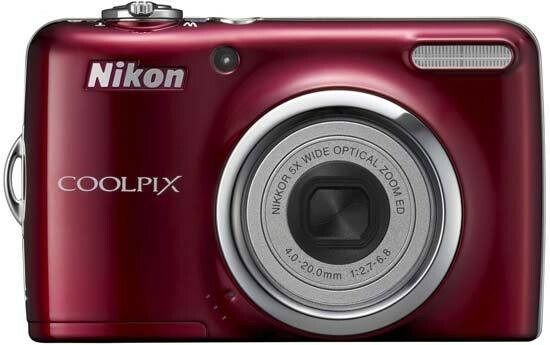 The Nikon Coolpix L23 is available in pink, red, blue, silve or black and costs £69.99 / €81.00. Styled in the shape of Nikon Coolpix cameras from the past, the L23 has a thin body with a slightly bulky right side which houses the AA batteries but also provides a hand grip for taking pictures with one hand or holding it when it's not in use. Buttons and switches have been kept to a minimum on the design and on the top plate, the power button and shutter release with a zoom rocker wrapped around it is all that's available. The thin design means that it's easily pocketable so the Coolpix L23 is a great camera for simply slipping into a bag or pocket and taking out anywhere you want to go. The lens has a 5x optical zoom, expanded from the previous L22 model which had a 3.6x optical. The 5x zoom gives the lens a focal range of 28-140mm in 35mm terms which will cover most scenarios that you may need a zoom for. It also boasts an ED lens element to reduce chromatic aberration in high contrast scenes. On the back is a 2.7 inch LCD screen that covers the majority of the available area while the rest of the buttons sit to the right ready to be operated with a thumb. They're arranged in a convenient plan that's easy to get accustomed to so you're not having to constantly look down and Nikon boast simplicity in operation of the L23. It certainly rings true with the features that are available, for example switching between taking pictures and looking at the ones you've taken is done by flicking between the green camera and blue arrow buttons. Pressing the green camera button while in the taking pictures setting will bring up a shooting menu. You can choose from easy auto mode, 17 scene modes, smart portrait, video and normal portrait mode. The easy auto mode is perfect for the user who doesn't want to think about taking pictures. It closes off all systems in the menu except resolution and will even analyse the scene and select the correct setting for the camera. The pad on the back of the Nikon Coolpix L23 that surrounds the OK button accesses four main settings that you should often use. Pressing up will access the flash options so you can choose to turn the flash off all the time or turn it on even in bright light. There's also a red-eye reduction option and slow synchro mode. To the right is the exposure compensation which will allow you to brighten or darken the image by up to two stops. It forces the aperture open or closed against the meter reading but this can also force a slower shutter speed so use it only if you know how it will affect the picture. If you enjoy shooting close ups, press the down button to enable the macro mode. It's not true macro in the same way that a DSLR uses macro lenses, but it allows for a closer focusing making the subject bigger in the frame. In fact, it will allow you to focus at 3cm instead of the usual 30cm. On the left is the self timer which is great for getting in the picture yourself. This pad doubles up as a navigation pad when you access any menu systems or the scene selection mode. There are a number of continuous shooting modes including the normal burst mode that will shoot a short burst of around three or four pictures before slowing and in a ten second period, it can fire off around 8 pictures. There's also the multi-shot 16 mode which will take 16 shots in under a second. However, the downside of this is that all those 16 pictures are placed onto one image. The resolution is also reduced to 5 megapixels to ensure a speedy burst. The Nikon Coolpix L23 does boast a video mode, but it's only a 640x480 pixel (VGA) resolution mode which can only really be viewed on a computer screen. It's good for Youtube uploads but may not suffice for watching a holiday video on a large screen in the living room. It does run at 30fps which means the motion in camera is nice and smooth. These days, whether you like AA batteries or not is a bit of a Marmite complexity. You either love them or you hate them. The advantages are that if you're on holiday and the batteries run out on a day trip, AA batteries can be found in any shop. If your lithium ion battery runs out, you don't have an option. On the other hand, AA batteries are more likely to run out because they don't hold as much power. Lithium ion batteries will last for a few days of regular shooting while AA batteries won't last that long. In the same compartment as the battery bay, you'll find the memory card slot. The Nikon Coolpix L23 has an internal memory, but it's only 22Mb. The camera will take SD (Secure Digital), SDHC (High Capacity: 4Gb - 32Gb) and even the new SDXC (Extreme Capacity: 64Gb - theoretical 2Tb, or 2048Gb). It's unlikely that you'll need a card so big in a camera so small, but should you need a card and that's all available, the camera can handle it. The accessories in the box are added sparingly. In fact all you get is a wrist strap, a USB cable for linking the camera directly to your computer, View NX2 which is Nikon's image viewing platform if you don't have an editor on your computer. There's also a set of AA batteries (which means no charger) and the manual. Memory cards in the box are pretty much a thing of the past these days with a small selection of exceptions. 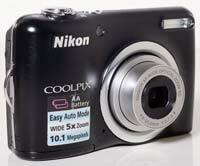 Because the Nikon Coolpix L23 has the afore mentioned internal memory, a memory card isn't supplied by Nikon. However, they're pretty cheap these days, so don't worry about it too much. You can add to these accessories if you wish and Nikon offer a small selection of optional accessories from chargers to video leads. There are others available from independent companies that will do the job just as good so have a good shop around first.